I’ve always loved the flavors of Thai food. They are reminiscent of Chinese and Indian, yet entirely unique to itself. Years ago, I dabbled in making Thai food at home, but that was many moons ago. 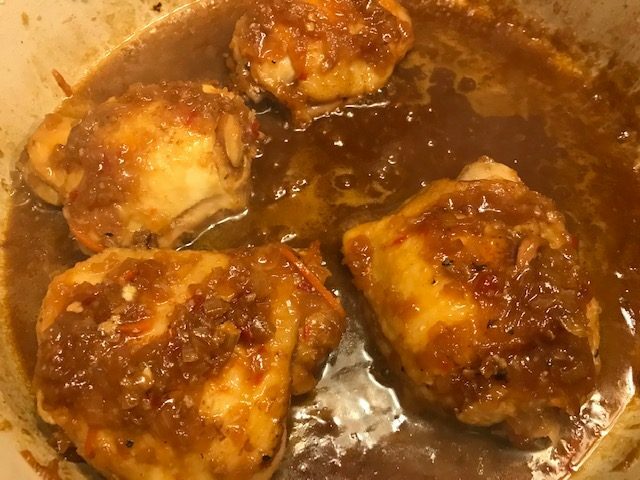 This week’s recipe for Cook the Book Fridays Sweet Chili Chicken Thighs from Everyday Dorie is hardly authentic Thai food, but the main ingredient in the sauce is the sweet-sticky dip that comes with fried Thai spring rolls. The chicken is quick enough to pull together for a weeknight meal, prepared in a single pot. 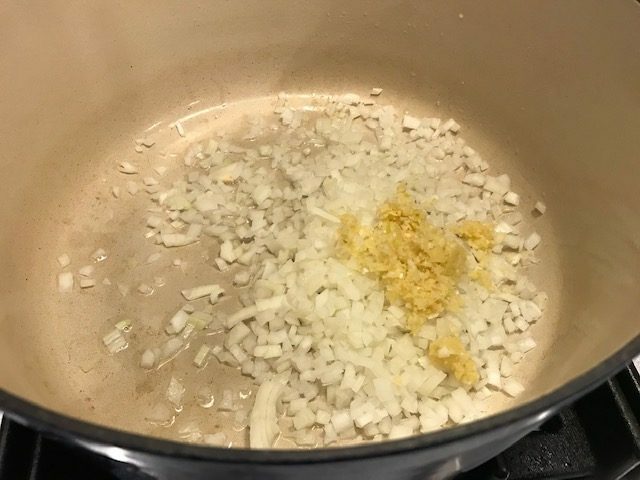 First, onions, garlic, and ginger are lightly sautéed until soft, but not browned. The aromatics are finished in some white wine which is cooked until it almost evaporates. Now, in the only fussy part of the recipe, the onion mixture gets transferred to a bowl while you brown the chicken. And in another fussy part — which I skipped – you are supposed to wash out the pot if there are any browned bits stuck to the bottom after browning the chicken. Browned bits always stick to the pot. Without understanding why that would make any difference, I just kept going with the recipe and didn’t notice any adverse effect. After the chicken is browned, the onions get added back along with chili sauce, soy sauce, Dijon mustard, and Sriracha and the mixture simmers, mostly unattended, until the chicken is done. In my case, with the occasional basting, this took only 20 minutes. The chicken is served garnished with sliced scallions, and if you want some added heat, red pepper flakes. I took the Thai inspiration to heart when deciding on side dishes. I cooked only 4 thighs but kept the other ingredients the same. Jasmine rice seemed like a natural accompaniment, both for flavor and an edible sponge for the extra sauce. My favorite part of the meal were the roasted vegetables I made. I roasted an assortment of diced root vegetables – carrots, sweet potato, parsnips, and red onion – until tender and browned. While the vegetables cooked, I simmered a red curry sauce made from coconut milk, red curry paste, fish sauce, and a spoonful of brown sugar I thought the sauce would thicken more, but because it didn’t, just before serving, I tossed the vegetables in just enough sauce to coat but not pool in the bowl. Yum! This turned out to be an easy weeknight meal with some flavors from somewhere else to transport you out of your routine for an hour or so. If you want to try it yourself, you can find the recipe on page 114 of Dorie Greenspan’s Everyday Dorie. My friends from Cook the Book Fridays share their reviews here. 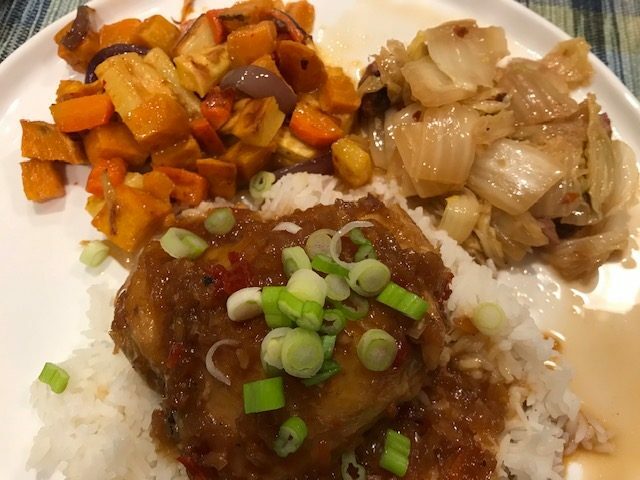 Posted on 8 February 2019, in Cook The Book Fridays, Everyday Dorie and tagged chicken, Cook The Book Fridays, Everyday Dorie, root vegetables, Thai flavors. Bookmark the permalink. 11 Comments. Your chicken looks delicious!!! I still have to write my post but did make these. I agree with Tricia, your veggies sound terrific and the idea of roasting prior to the sauce sounds like a perfect plan!! Thai is one of my two or three favorite food types. Great reminder to make more of it. Everything looks so delicious. We skipped the part about the brown bits also, couldn’t see the reason because normally they are the tasty flavors. Definitely a repeat recipe and looking forward to trying the sauce on the pork tenderloin. Ha! I didn’t scrub out the pan either. It was quite delicious! Love the veggies you paired with this! I like your pairing with the roasted vegetable. Sounds delicious! We love the chicken thighs, will definitely be cooking it again! The first time I made the dish, I didn’t wash out the pot. Some burnt pieces stuck to the pot making it hard to turn up the heat to baste the chicken pieces. To avoid that, I took out the second pot the second time I cooked this recipe. That works out better for me, but not for the dishwasher, my husband. The roasted vegetables show up a lot in my kitchen. Can’t beat the combination of the two. Wow, I served mine with roasted root vegetables too! This will be a staple in our house. I only made half the recipe also, Betsy, but loaded up on rice (and, sauce). This lasted for two lunches and two dinners – never got tired of it. I really like the sound (and bet I will like the taste) of your roasted vegetables with red curry sauce. Have noted your recipe. This was another delicious recipe from our Dorie. Don’t understand the washing of the pan but I used two pans anyway! Your curry sauce for root vegetables sounds perfect! I love curry! This was one of our very favorite Dorie recipes. I’m with you and didn’t wash out the pot between brownings either! Thanks for the podcast link Betsy! I’ve listened, enjoyed and passed it on to others!